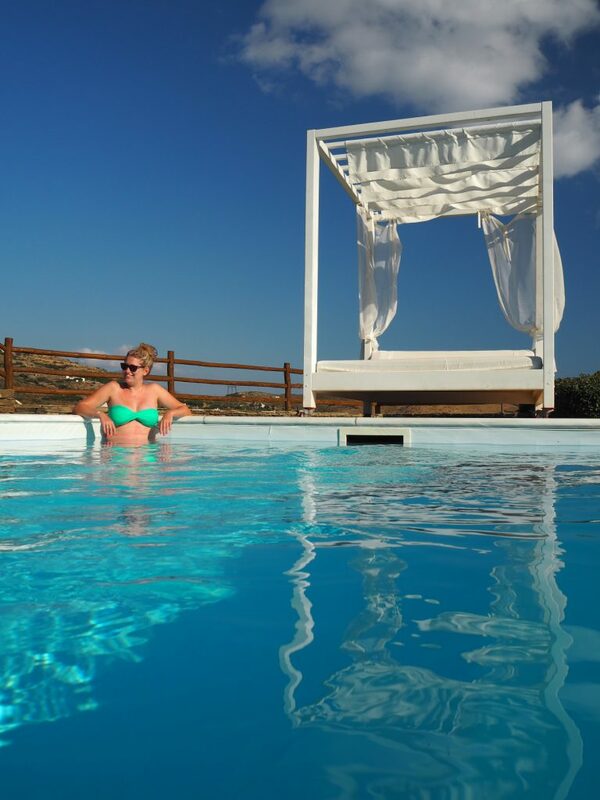 Heliades Villas – The best place to stay in Andros? 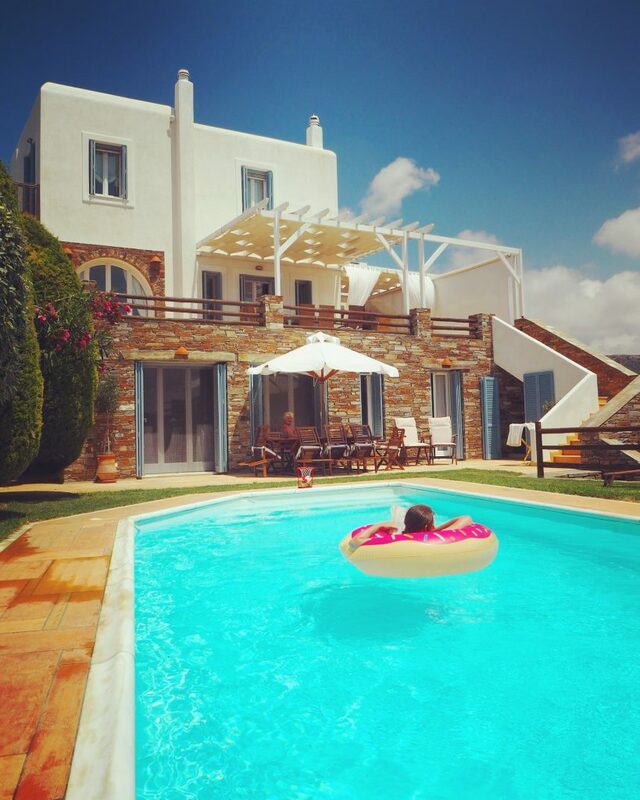 I think Heliades Villas might just be the most luxurious and beautiful villas in Andros and the best place for your family getaway for a week in the sun! 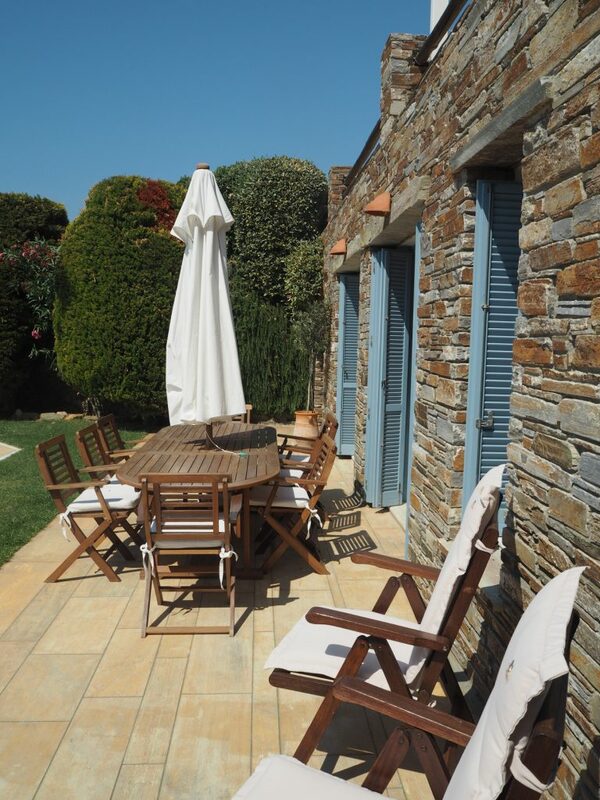 If you’re looking for a place to stay in Andros, look no further! With any holiday you always wonder if things really will look like the photos, having spent the previous weeks checking them out on the Heliades Villas website. Well, Heliadas did not disappoint. They were quite simply perfect and I honestly can’t recommend them enough. In Greek Mythology ‘Heliades’ were the daughters of the sun. Helias, Etheria and Phivi are the names of the three Heliades Villas. Certainly very apt names for three sun soaked villas on the island of Andros! Olly and I arrived a few hours after my mum, Tim and sisters and were instantly greeted with ‘wow’ and ‘you’re going to love it’ before we’d even stepped inside. 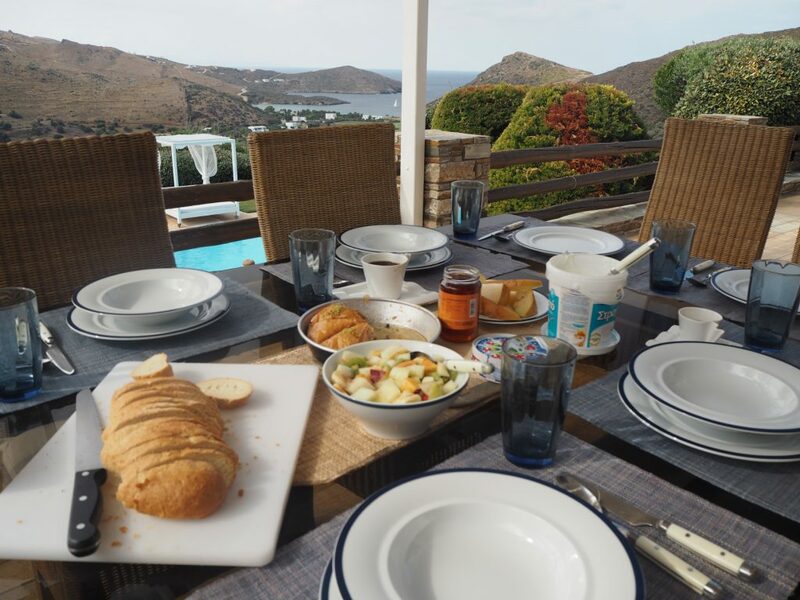 The villa is about a 15 minute drive from the main port of Gavrio where all the boats come in from the other islands (the only way to get to Andros is via boat). The winding gravel road up a steep hill might suggest you are heading towards an old farmhouse but once you drive through the iron gates and walk up the paved steps to the villa you realise the reality is far different. The three villas are each unique with different interiors and private pools. They are designed to the highest quality and mix modern comfort with beautiful antiques and fine art. From granite worktops in the kitchens and bathrooms to marble interiors and plush sofas and arm chairs, I felt like I’d walked into my future home! (One day when we can afford it eh?) 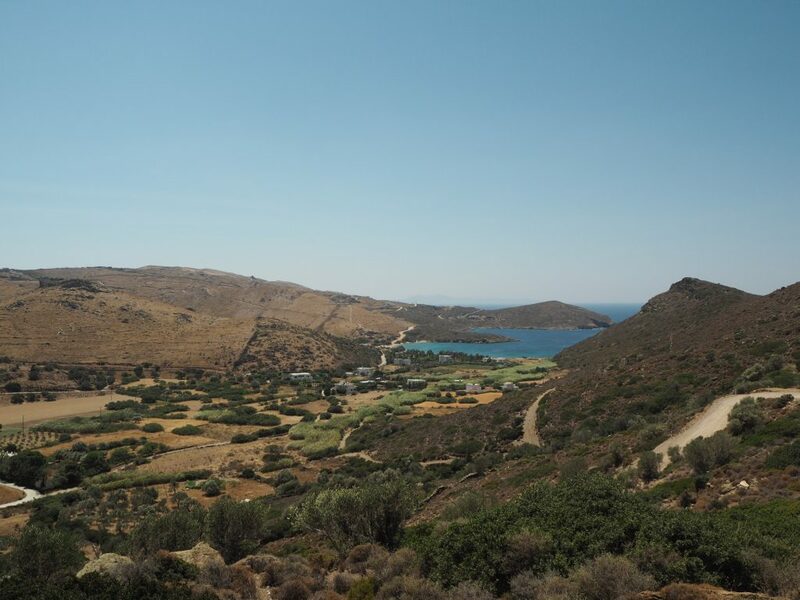 Until then it’s a perfect place for an escape, whether that’s to laze by the pool for a week, to use as a base to hike around the island and learn about Andros’ rich history and culture or to stuff yourself with gyros all day! The pool glistened in the fading sun tempting us to jump in as soon as we arrived. 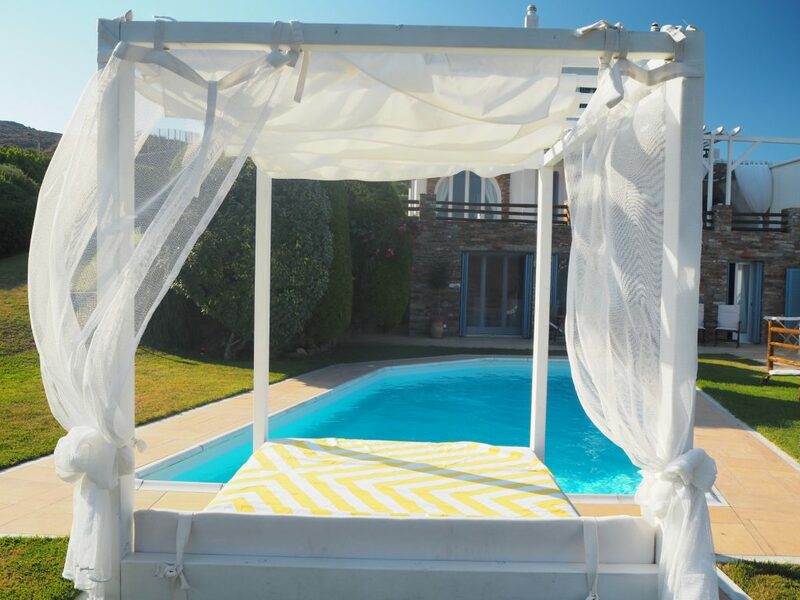 With a four poster sun bed and outside bbq and sink area you could live outside in luxury without even needing to step into the villa. There is a large 8 seater dining area and outside shower too. 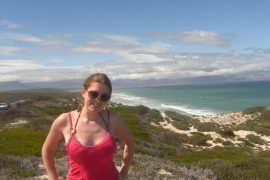 Though perhaps best of all is the lush green garden with spectacular views to the ocean. Be careful of walking bare foot on the grass though as we spotted a few bees feeding off the small flowers. The pool is cleaned every morning and Vinny clears away the lounger cushions each night to stop any condensation over night and puts them back again in the morning. Now that’s service! 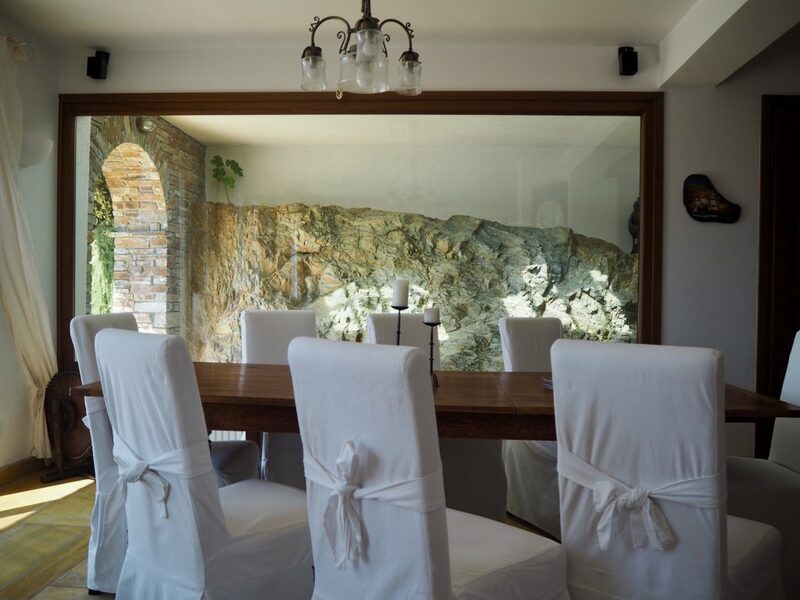 At pool level you enter the house through one of 4 doors, the main door is via a small passageway built into the stone with a full width panoramic window so you can get a sneak peak of what’s to come inside. I felt like the whole house was made to entertain, big long dining tables, open plan living areas with plenty of comfy seating and large well equipped kitchens (yes kitchenS, there are two!). 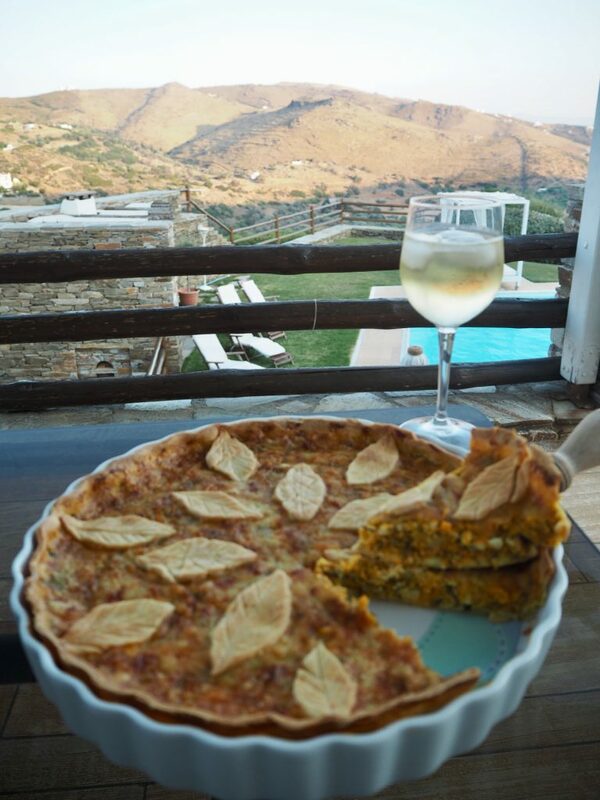 You could imagine bringing your family and cooking up a feast as kids run riot and local wine is passed from one end of the table to another (Yes I am imaging Under the Tuscan sun… the Andros version!). 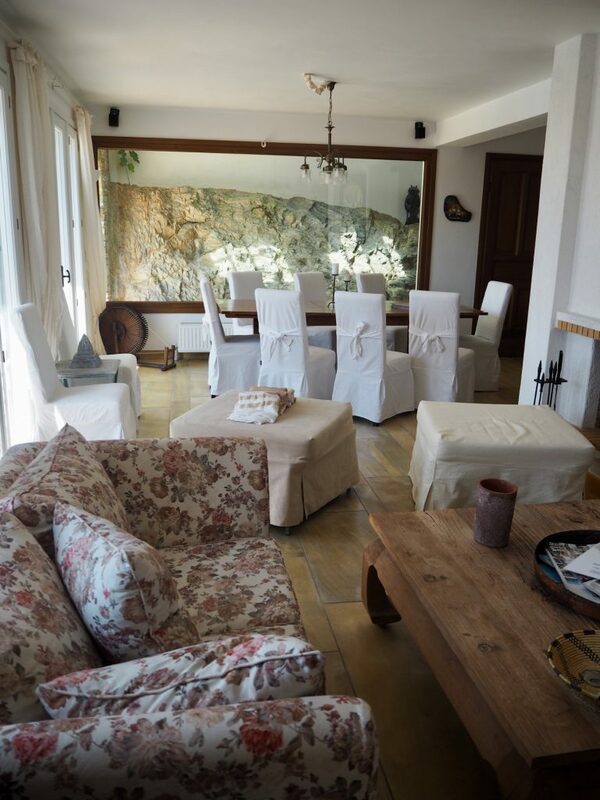 The villa felt like a proper home rather than a holiday home with lots of small touches like creative art on the wall, antiques and books dotted around the house. Korinna has put lot of time and love into these villas for everyone who visits to enjoy. 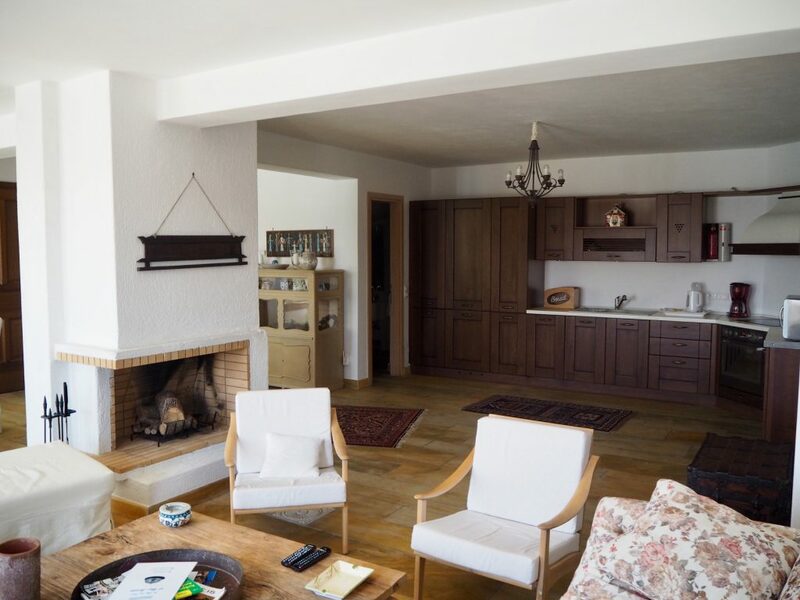 The second living space on the first floor is equally sized to the ground floor, with a large living space, round dining table and another big kitchen. 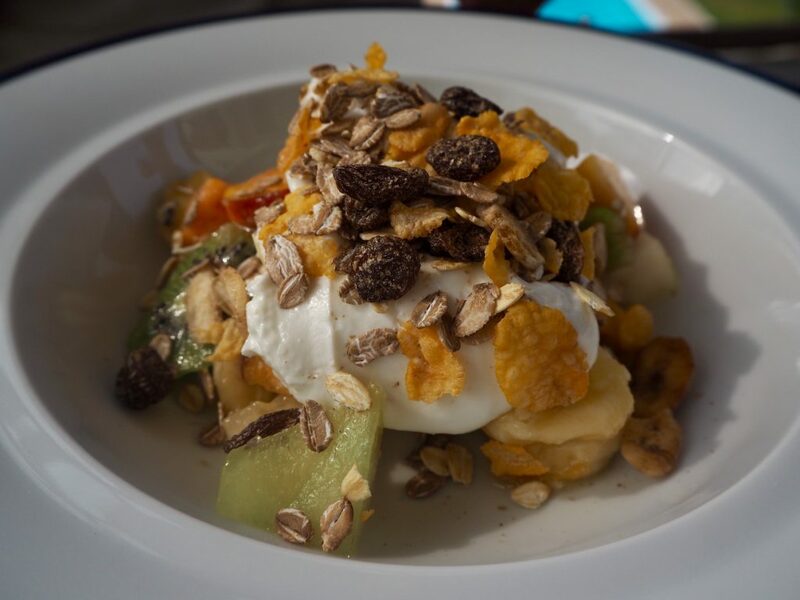 We opted to use the first floor kitchen while we were there as loved eating out on the verandah at night overlooking the pool from above. Make sure you get lots of water as you’ll want to be drinking plenty to stay hydrated in the summer sun. The tap water isn’t potable on the island, but you will find freshwater springs in many of the villages so, if you’re feeling especially thrifty, fill up your bottles there! There are three double bedrooms, and one twin. Each with their own unique character, the two on the top floor have en suites and balconies. Andros can get quite windy so the balcony off the main bedroom can be pretty much off limits on particularly windy days, however there’s seating on the main veranda below which is well sheltered from the breeze. We opted for the largest room, though made use of the shower in the en-suite bedroom next door. I can imagine enjoying a big bubbly spa bath if I was staying in the villa in winter though. 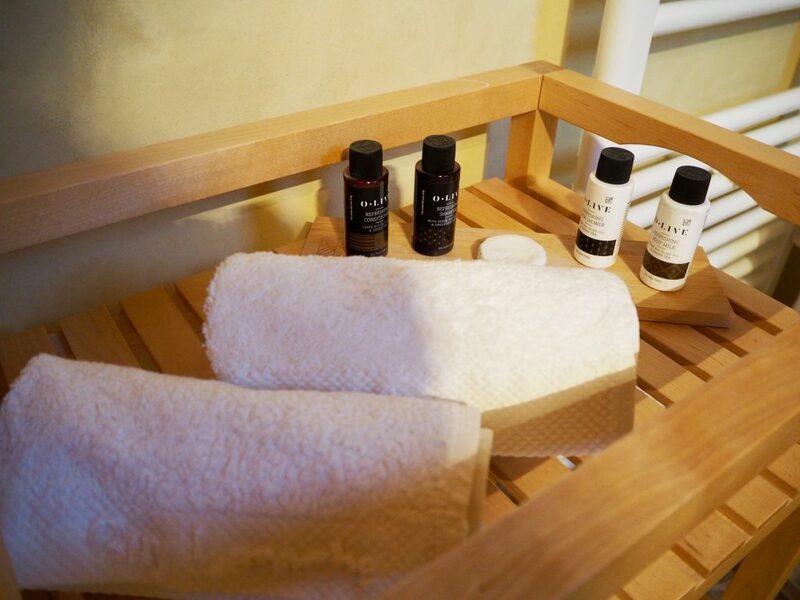 They provided us with fresh towels, bathrobes and bathroom supplies like body-wash, shampoo, etc, so it felt at times more like a hotel than a villa. 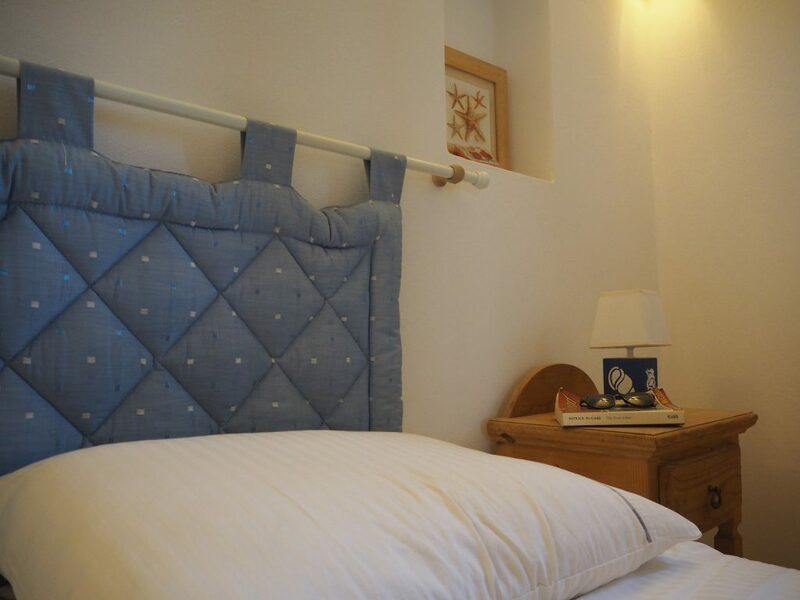 Our bed was a very comfy king size and all the bedrooms of course have air conditioning – believe me, in the summer you’ll be grateful for it! I think I’ve said this before but comfy beds and plush pillows are paramount for me everywhere I stay and with extra pillows if you needed them in the cupboard and wide comfy beds Heliades ticked all the bed boxes! The two ground floor bedrooms share a bathroom with large shower and the front room has a door straight out to the pool. I’m told by mum, Tim and sisters their beds were extra comfy too and there is plenty of space in every bedroom to unpack and spread your stuff across the room. 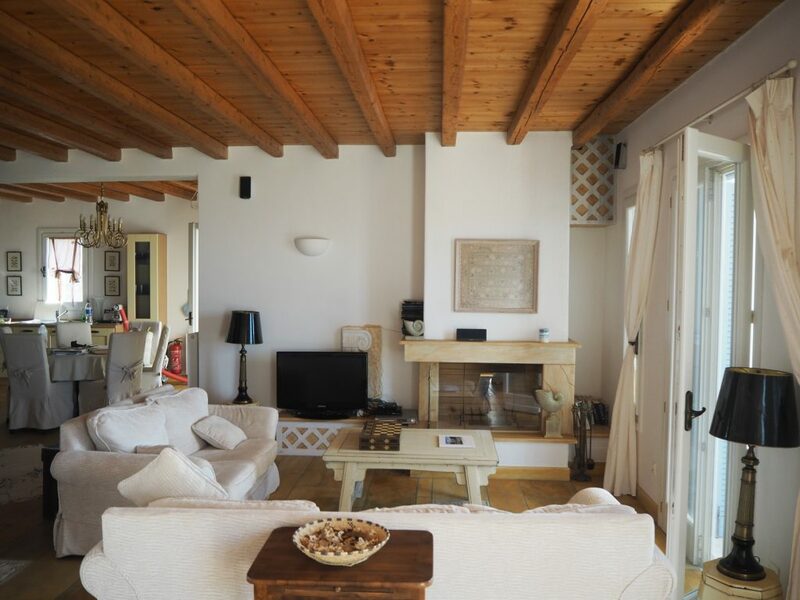 Though this villa is great for a week in the sun, with a beautiful private pool and air conditioning throughout the house, I could equally imagine staying here in winter. Though it might not drop as cold as the UK, it could be just about chilly enough to put on the open fire and snuggle on the sofa with a hot chocolate and a good book. Throughout our stay Korinna and her team were always on hand to help, from welcoming us at the airport and helping us get tickets for the boat, to meeting us the other side to make sure we got our car hire sorted. You will need to hire a car if visiting the villa as you can’t walk anywhere very easily from the villa, though wherever you stay in Andros you would probably want a car to explore the island and visit some of the authentic restaurants in the middle of nowhere. How much does Heliadas villas cost? As a luxury villa it isn’t the cheapest accommodation on the island, but you definitely get what you pay for at Heliadas Villas! 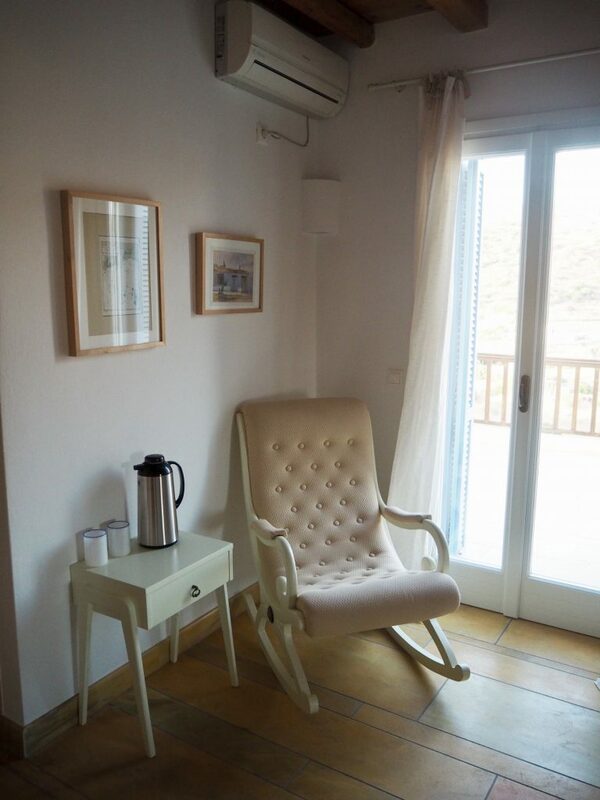 Prices range from a few hundred euros for 3 days in low season to €4000 for a week in peak season. It might seem a lot but the villa sleeps 8 so if you bring all your friends that’s only €500 each for a week in absolute luxury! What can we do in and around Heliades Villas? 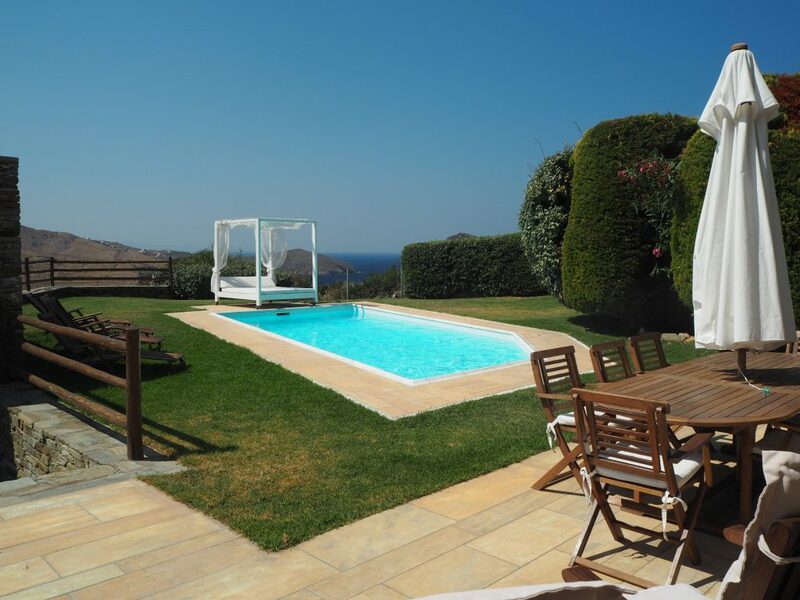 The three villas sit proud on a hill in the west of the island less than a 15 minute drive from the port town of Gavrio. There are lots of places to eat there day and night. 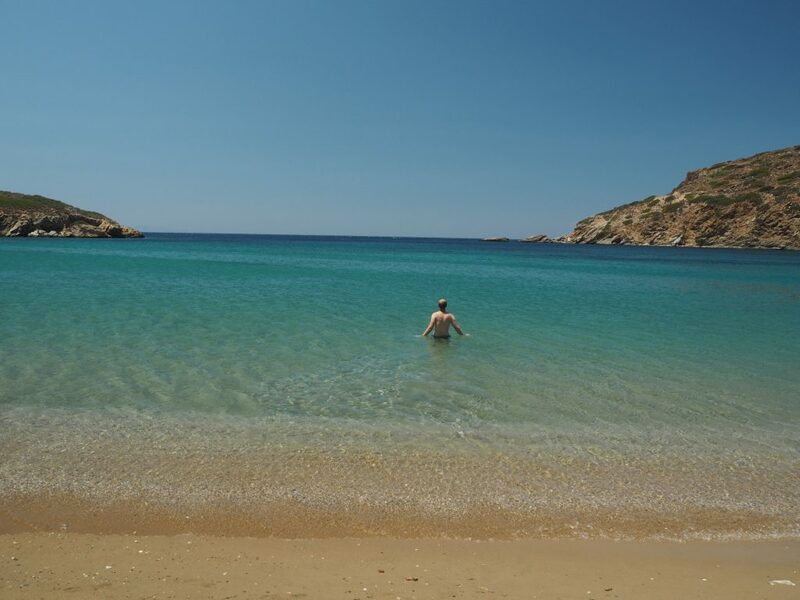 If you want to stay even closer then just a few minutes from the villa is Fellos beach, a beautiful secluded beach with a few trees on the beach for cover from the sun. I’m not sure how long it will last this way as the island becomes more touristy but for now even in peak season there weren’t more than 50 people on the wide open beach. The local restaurant Steki tou Andrea was perhaps our favourite of the whole week. 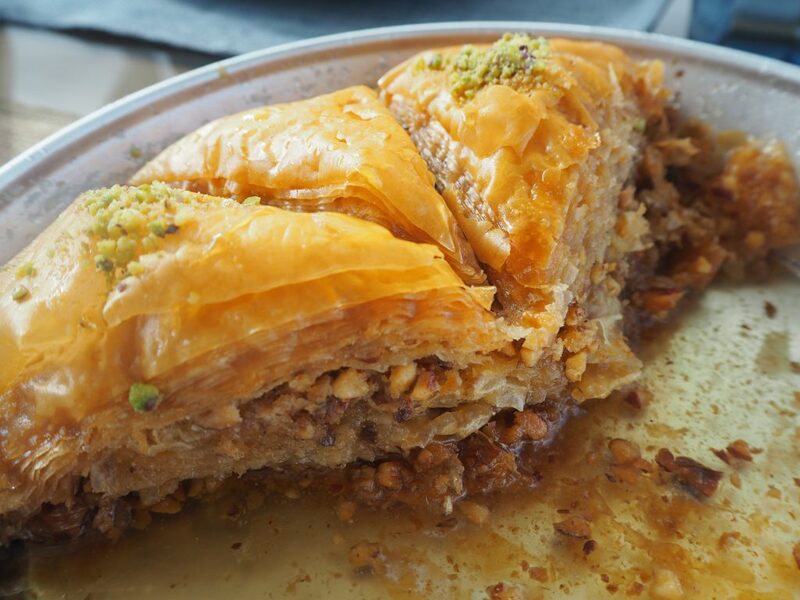 With mouthwatering local food and very friendly service. 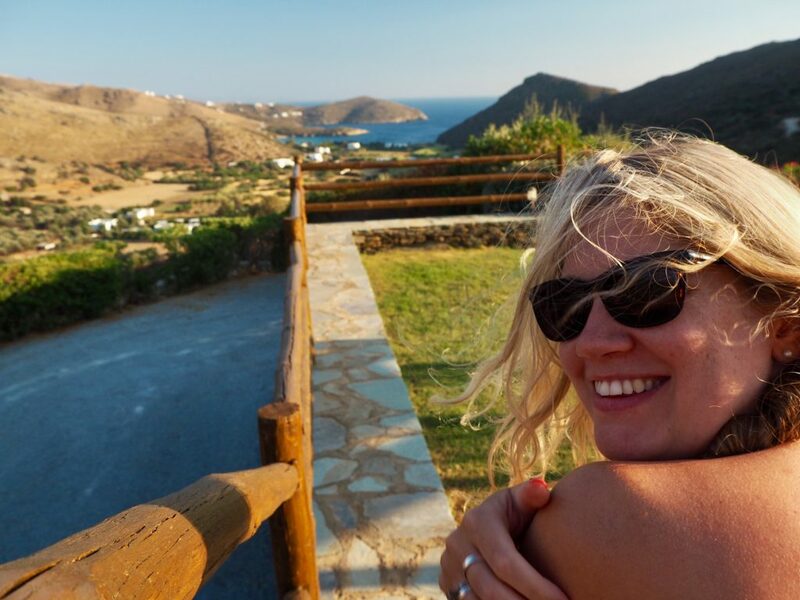 I am writing a full itinerary of what to do on Andros so look out for more information coming your way soon! 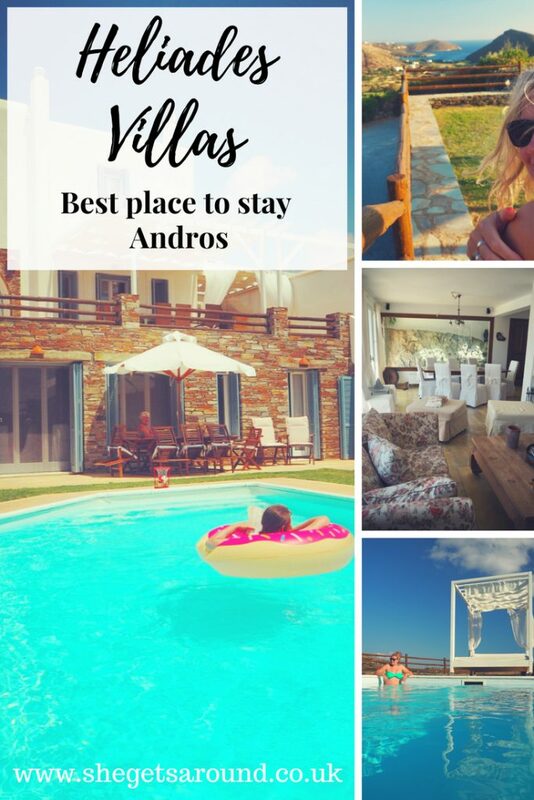 I was invited to review Heliades villas with my family, they also organised an amazing itinerary showing us the best of Andros. 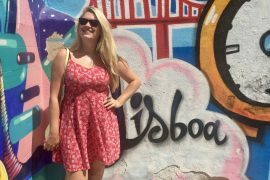 They are open to organising excursions for anyone who stays and offer loads of recommendations for the best places to eat and things to do too. As always all words and thoughts are honest and true to my experience. It’s actually been quite hard to give a balanced account and add in some less than perfect comments, because I really can’t fault it! 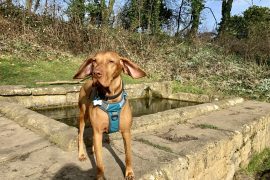 A dog friendly weekend in Moreton-on-Marsh, Cotswolds. 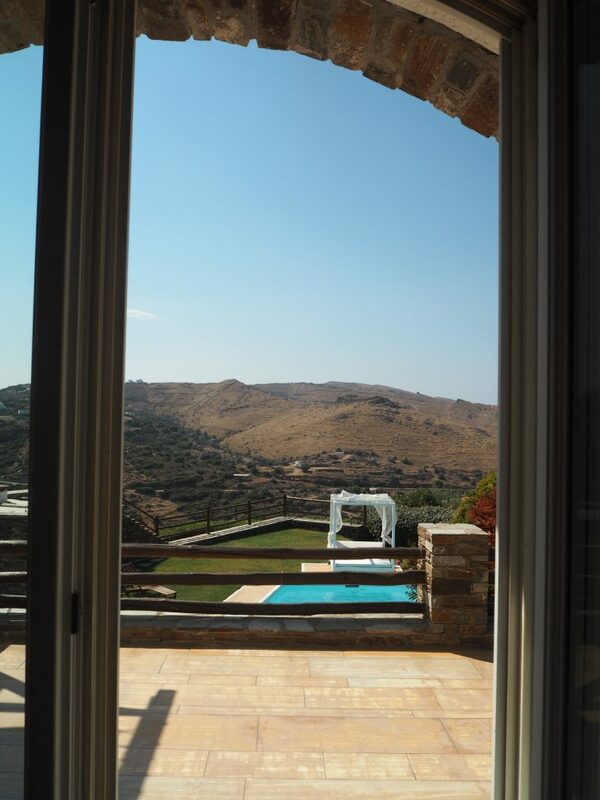 This looks like a dream stay – I LOVE Greece but have never stayed in a villa before, always in a resort. What a beautiful destination too, another for the bucket list! Back in the UK… Plotting my next adventure! The Blue Lagoon – How to Survive a Storm in Iceland!